Konfidence Swim Jacket - Navy/Blue/Palm - 1..
Konfidence Swim Jacket - Navy/Blue/Palm - 4..
Konfidence Swim Jacket - Navy/Blue/Palm - 6..
Konfidence Swim Jacket - Navy/Pink/Hibiscus..
Konfidence Swim Jacket - Red/Yellow - 18 Mo..
Konfidence Swim Jacket - Red/Yellow - 4-5 Y..
Konfidence Swim Jacket - Red/Yellow - 6-7 Y..
Konfidence Floatsuit - Clownfish - 1-2 Year..
Konfidence Floatsuit - Clownfish - 2-3 Year..
Konfidence Floatsuit - Fuchsia (Pink Hibisc..
Konfidence Floatsuit - Navy Polka Dot - 1-2..
Konfidence Floatsuit - Navy Polka Dot - 2-3..
Konfidence Floatsuit - Pink/Breton - 1-2 Ye..
Konfidence Floatsuit - Pink/Breton - 2-3 Ye..
Konfidence Floatsuit - Navy/Breton - 1-2 Ye..
Konfidence Floatsuit - Navy/Breton - 2-3 Ye..
Konfidence Babywarma Baby Wetsuit - Fuchsia.. If you're taking your baby or toddler swimming, the first thing of which you need to make sure is that they're hygienically safe and sound. Choose the Konfidence AquaNappy for the total solution, with their one-size-fits-all design making them superb value. Incorporating a triple layer design, the AquaNappy baby swim nappy consists of a soft polyester outer layer, a recycled PVC middle barrier layer and a soft inner mesh layer. The reusable, eco-friendly swim nappy is made doubly secure with an adjustable Velcro sash and poppers, allowing it to be sized up from 3 months to around 30 months in age. No other layers or inserts are required – just pop it on your little one and they're ready to go swimming. 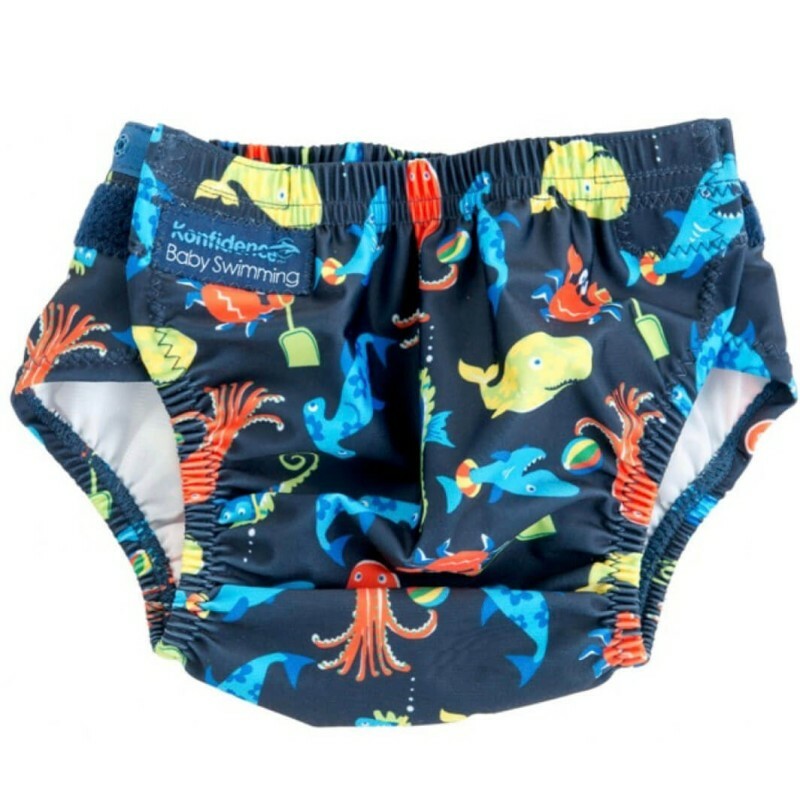 Tested and endorsed by swim schools since its launch almost ten years ago, this multi award-winning swim nappy has time and again proven to be the most effective solution for preventing little accidents from spoiling swimming days. And, of course, they're machine-washable. The Konfidence AquaNappy is the only swimming nappy you'll ever need. The Konfidence AquaNappy should be washed in cold clean water and hung to dry in the shade. Do not tumble dry and do not iron. If the nappy is used in the swimming pool or sea, chlorine and seawater can have a bleaching effect on the colours and damage Lycra threads, so to avoid degradation please rinse out in clean water as soon as possible. Please do not leave in a warm or hot car without rinsing first, as this can increase the chance of chlorine damage. The major components we use are polyester, polyester mesh, recycled TPU, Velcro and plastic popper tape.